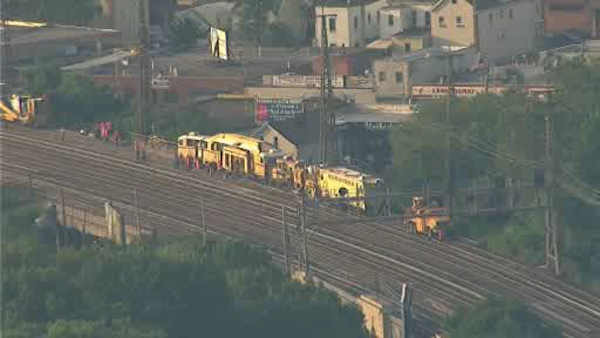 NEW YORK (WABC) -- LIRR commuters are dealing with service disruptions Monday due to a derailed track work car. Riders were advised to expect delays and possible cancellations for the evenings rush hour after morning trains faced delays averaging up to 40 minutes, but so far, trains are operating on or close to schedule. The MTA says repairs are ongoing, but it is unclear when they will be finished. The non-passenger work car derailed east of Woodside. NYC Transit is cross-honoring LIRR fares via the 2/3 subway from Atlantic Terminal and the 7 subway from Hunters Point Avenue, as well as LIRR fares via the 7 subway from Woodside, and the E subway from Penn, Forest Hills (71st Ave), and Kew Gardens (Union Turnpike). For service from Penn Station to Woodside, passengers are advised to board Port Washington-bound trains. Eastbound customers at Woodside may also board westbound LIRR trains and transfer at Penn for eastbound service.